Seminar: “On Some Trends in Energy Utilities in Europe"
The main scope of the Data Science program is to train students in using state-of-the-art techniques of machine learning and data analytics, with a focus on real-world applications of these emerging technologies. Students will learn how to develop automated methods to analyze massive amounts of data with the goal of extracting knowledge from them to create an impact on organizational decisions. The graduates of the program are trained to perform original research in their chosen area of machine learning and data analytics and apply the results of their research in an industrial context. IT related bachelor’s degree, or its equivalent in Mathematics, Computer Science, Information and Communication Technology, Applied Physics or other technical areas. Program is accredited by the Russian Government, certificate № 2568 from April 14, 2017. License № 2534 from February 7, 2017. 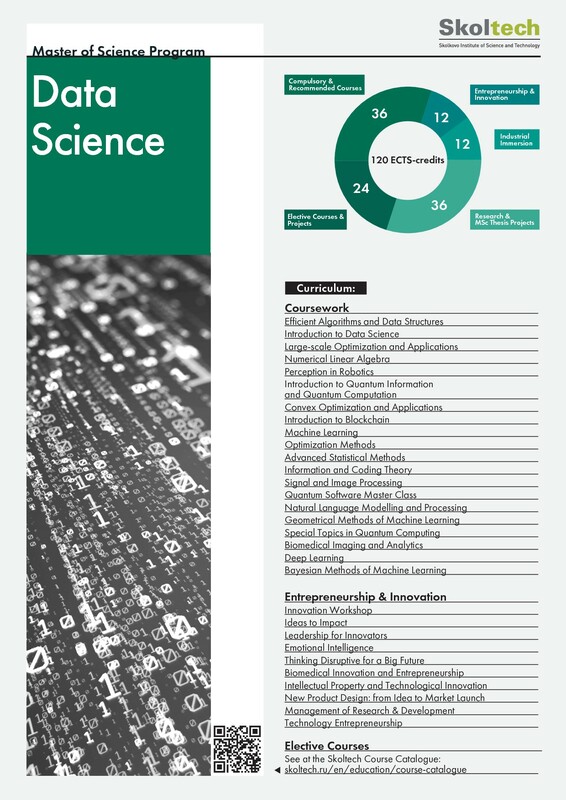 The aim of the program is to prepare the technological leaders of the future.The objective of the Data Science MSc program is to bridge the gap between fundamental science and cutting edge computational techniques. The curriculum of the program contains a balanced combination of topics developed very recently (e.g. deep learning) together with in-depth teaching of mathematical foundations (advanced linear algebra, optimization, high-dimensional statistics etc.). Main methodological aspects of both scientific research and application development in data science. Present results to different audiences (specialists, users, stakeholders, etc) in an effective oral and written manner. The Data Science MSc program was developed to meet the high demand of Data Science specialists in the growing national and international high-tech market. Graduates of the program may begin an international research career or work with a company (even during the period of study). Data Science MSc graduates significantly enhance their employability by developing their subject-specific knowledge in the field of data science and machine learning, as well as their analytical and research skills. Students gain the opportunity to obtain early access to the national and international research and innovation landscapes and can approach international employers with confidence. In addition, the program enhances students’ soft skills, enabling students to compete effectively in the job market. Students are actively involved into research activity starting from Term 3. Oleg Grinchuk and Aijan Ibraimova have NIPS* papers accepted that are based on their MSc thesis works. Alexander Anikin, Andrey Rykov, Vladislav Ishimtsev and Denis Volkhonskiy became prize winners at International Data Science Game 2016-2017.